At Satellite, we’re all about connecting with other people and honouring everyone’s story, no matter what. 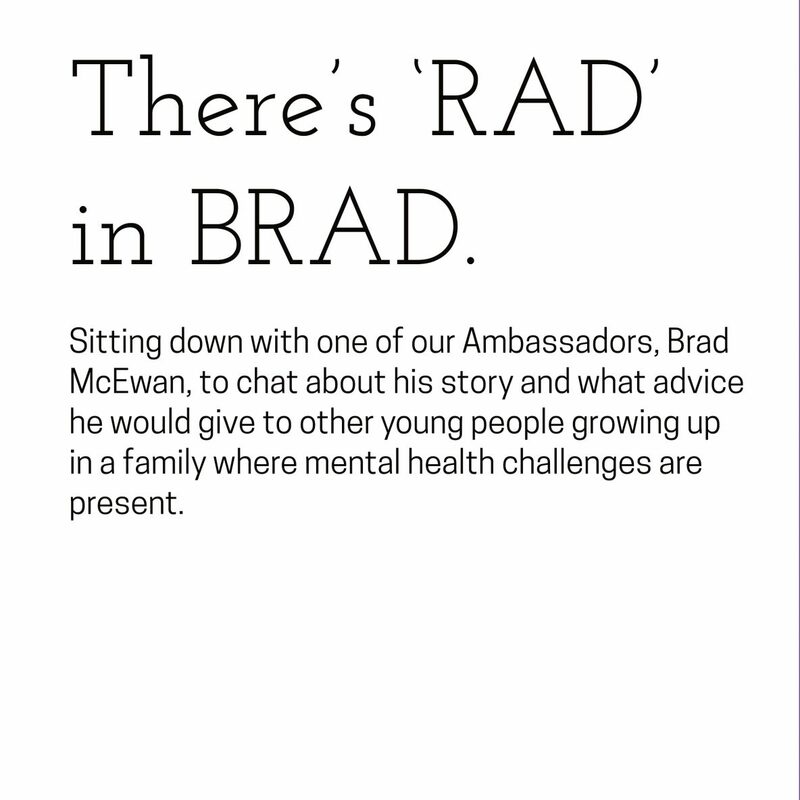 Our Lived Experience Co-ordinator recently had the privilege of sitting down with one of our Ambassadors, Brad McEwan, to chat about his story and what advice he would give to other young people growing up in a family where mental health challenges are present. Throughout the interview Brad spoke about how important it is to have peer support, and programs that facilitate it, because there’s so much power in bringing these young people together, allowing them to meet somebody who knows what they’re feeling and how difficult things are at home. The circumstances might be different but they are dealing with somebody at home who has a mental illness, this is the common ground that brings them together. Brad also reiterated how important it is to have people of your own age that can be there to support you, to listen, to not judge, as well as to be able to meet older people, like him, as an example of someone who has triumphed. He went through some really difficult stuff as a teen but got through it and came out at the other side with the help of a lot of people. Laura: Could you tell us a bit about your story? Brad: I met Rose (Co-Founder of Satellite) through my role as a Beyond Blue ambassador. I came across Beyond Blue in my work with Channel 10. I have been a Beyond Blue ambassador because of our family’s history and I always make a point of saying ‘it’s not just what happened with me, it’s all of us’, particularly my sister and my mum and everyone that’s involved. Laura: Definitely, it’s really admirable of you. Brad: When we were younger, um, my older brother suicided. I was 17, my sister would have been 16 and then 18 months later my father suicided… so having been through all of that I felt like an imposter if I wasn’t going to then get up and help other people. I’ve got a story to share. Now I get up and I talk to different groups on behalf of Beyond Blue about the warning signs of Mental Health issues and what they can do about [them]. And [a few years ago] I hosted a function for Satellite Foundation and I’m still here. Laura: Do you have ways that you check in with yourself to make sure that you’re not doing too much or not sharing too much of yourself? Brad: Definitely. When life gets a little bit busy sometimes I just pull back a little bit. You know, I’m in my late 40’s and I know when the balance isn’t quite right. And over the journey whenever I have known in myself that I’m not feeling great, I go off to the GP and get the help that I need, because as I often say, I can’t be standing up there and be telling everybody to look after their mental health and what to look out for and get treatment if I were then not getting the help that I need. Laura: Yes that’s very true. I agree. Brad: Something I strongly suggest to everybody is: Go and talk to someone. Get the help that you need because it works. There are some fabulously talented and passionate people out there who are there to help. Laura: You’ve taken part in three of our Satellite events, can you tell us about your experiences of those events? Brad: It was very positive. It was really special to hear people talk openly (particularly younger people) about what they’re going through and what their families are going through. There’s always light at the end of the tunnel. Life can be really difficult already, and when you’re dealing with a mental illness in your family it’s even more difficult but you can get through it. Laura: What advice would you give a young person who’s facing a situation similar to yours? Brad: There’s nothing to be ashamed of with a mental illness. We all openly talk about physical ailments in our life and they’re not our fault and it’s exactly the same with a mental illness. But first and foremost you’ve got to look after yourself. You are number one and you can’t do anything, you can’t help anyone if you’re not okay. [And ask for help] because there are so many great people out there and organisations who are there to help. Laura: It’s been an honour and a privilege to talk with you, Brad. Thank you.